Yes, this 1984 film is corny and has a fair dose of sentimentality, both of which can usually prevent a movie from being taken seriously. However, this work, directed by Barry Levinson and adapted from the Bernard Malamud novel, has mythic themes, good dialogue, and interesting characters which make it a meaningful movie. And it’s entertaining. 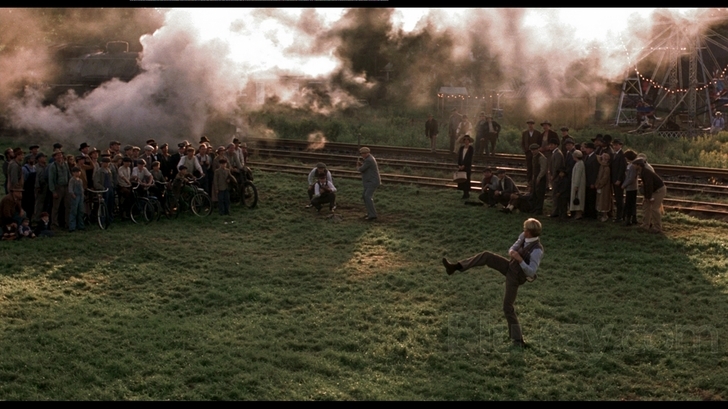 The first shot we see is that of the main character, Roy Hobbs (Robert Redford), waiting to take a train, early on in the twentieth century. He looks dejected, unsmiling, almost beaten down. But the fact that he is traveling somewhere suggests that he has not given up. We eventually see that what he really wants is to find a home, and trains have been and will be positive and negative means of transportation in his quest. 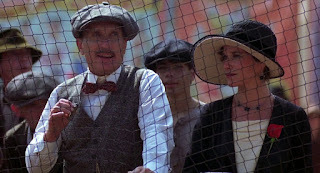 The next scene goes back to Roy’s childhood as he plays catch with his father. He lives on a farm, and the pastoral setting comes to represent the purity of the human heart that unscrupulous individuals can undermine. Roy is a “natural,” someone with an innate talent for baseball. Even as a youth he can fire a fastball that can shatter a fence. But his supportive father (Alan Fudge) warns him about the limitations of his abilities when he says, “You’ve got a gift, Roy. But it’s not enough. You’ve got to develop yourself. If you rely too much on your own gift, then you’ll fail.” With the father and son as they practice is Roy’s childhood sweetheart, Iris (her name places emphasis on sight, and in this case she has the right moral vision that can keep Roy’s eyes on the ball concerning what’s the right thing to do), and she watches over him like a guardian angel. Roy’s father has a heart attack later and dies while working in the field. This scene reminds us of the way Clark Kent’s dad meets his end in the movie Superman, which suggests that Roy has heroic powers, too. There are also references to Arthurian legend suggested in the movie. Lightning strikes a tree close to Roy’s house, leaving a chunk of wood jutting in an upright position. 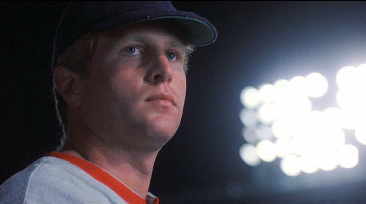 Roy cuts it off and forms it into a baseball bat on which he burns in the words “Wonderboy” followed by a lightning bolt. The name sounds like a comic book superhero.The bat is the equivalent of King Arthur’s Excalibur. The lightning bolt could be considered a reference to the gods, specifically Zeus, bestowing a gift to a mortal to make him rise above other humans. Years later the Chicago Cubs call Roy for a tryout. 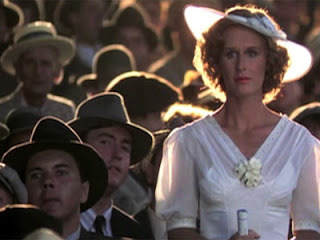 He goes to the grown-up Iris (Glenn Close) to tell her the good news. He says he wants to marry her after he is signed up. They appropriately consummate their relationship in the sanctity of the heartland represented by the barn on her farm, and the intimacy feels justified given that the two are soulmates. He tells her he never has been on a train before, which means he has not gone out into the world to test his strength of character. 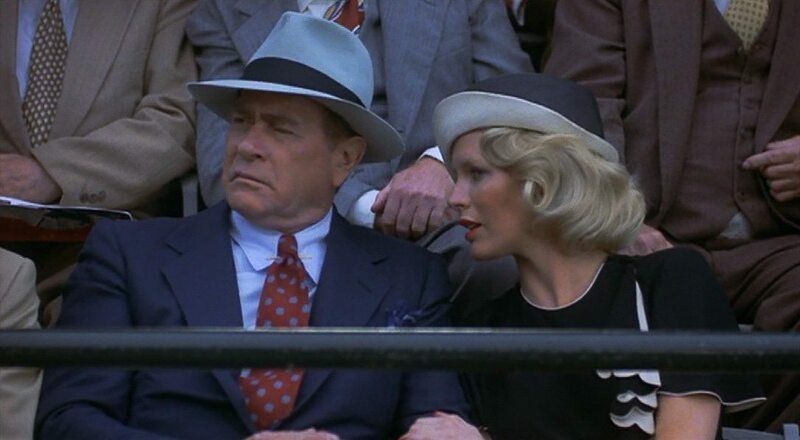 On the train, we find a Babe Ruth-like baseball player called The Whammer (Joe Don Baker) and the reporter traveling with him, Max Mercy (Robert Duvall), whose last name is ironic, because he shows none of that attribute. He actually uses the power of the press to make others beg for his mercy. Fame and success have corrupted The Whammer, who is boastful and materialistic. There is a foreshadowing of what’s to come when Max reads aloud about how someone shot two famous sports figures with silver bullets. 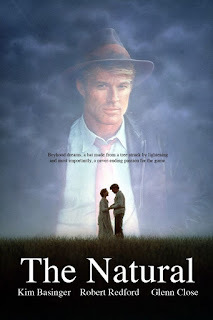 The Cubs scout, Sam Simpson (John Finnegan), a sort of father figure following the death of Roy’s dad, plays up Roy’s accomplishments in high school baseball, but the two men scoff at him. After Simpson leaves, The Whammer flashes his ring at a pretty woman in the car, whose name is Harriet Bird (Barbara Hershey), and who turns out to be the shooter, stalking her next victim. The train stops for a while at a carnival. 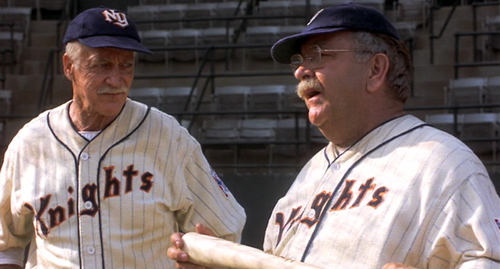 Simpson makes a bet with Max that Roy can strike out The Whammer on three pitches. Max assures Harriet that The Whammer is the best the game has ever seen. However, Roy strikes out The Whammer and is cheered by the crowd. We see Harriet move her gaze from The Whammer to Roy, as if adjusting the sights on her gun. In her conversation later with Roy, he is taken with her, and his move away from Iris on the train physically and spiritually causes his life to become derailed. She asks Roy if he has a girl in his life, but he ignores the question, and this denial of Iris shows his frailty and seals his fate. She makes allusions to Homer, and how if he were writing about baseball, the poet would have had a mind to write about Roy (whose first name sound like a shortened version of “royal”). But Roy’s only knowledge of Homer is in baseball when you get to run the bases to get to home plate. Homer has “home” in his name, and his character, Odysseus, also wants to get home after the Trojan War, but he must go through trials by ordeal before that happens. The same can be said of Roy, as he must go out in the world and survive before returning home. Roy tells Harriet that he will break all the records. 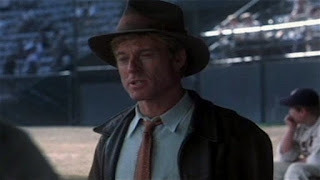 She asks, “And then?” He says then people will say there goes Roy Hobbs, the best there ever was in the game. She asks isn’t here more than that, something greater. But Roy has the fatal flaw of Greek heroes, the one of hubris, overweening pride. Harriet then disappears in the flickering lights, like an otherworldly entity blending into the darkness (symbolic of the frightening realm in which she resides). In Chicago, Harriet stays at Roy’s hotel and calls him to her room. She is dressed in a black negligee and pulls a veil down over her face, as if in mourning for what is to happen. Her outfit symbolically joins sexuality with tragedy. She asks him again if he will be the best in the game. When he affirms the boast, she shoots him in the left shoulder, near his pitching arm, and then we see that she no longer is in front of the window, having jumped to her death, her mission completed. She flies away, like the “Bird” her last name implies. Harriet plays the role of the “femme fatale,” or “fatal woman” who seduces the male and drains him of his power, like a vampire. This sexist archetype appears in many stories, including that of Eve and her apple, and Delilah cutting Samson’s hair in the bible. In Greek mythology, the Sirens try to destroy Odysseus with their alluring voices. Harriet is a cautionary figure who metes out punishment for those who take their gift for granted and adopt too prideful an attitude. God may giveth but he may also taketh away what he has bestowed if the recipient is undeserving. It is after sixteen years have passed that we join up with Roy on that train platform, trying to make up for the failure of the previous trip. He has been signed to play for the New York Knights (an appropriate name given the references to the Arthurian legend) after only being with a minor league team for a couple of weeks. New York can represent the corruption that occurs in the eastern part of the United States, where moral decay has taken hold in the cities as opposed to the “New Eden” of the unspoiled American west. 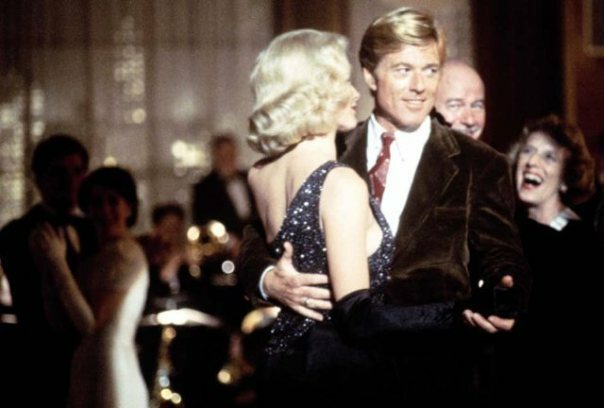 This theme shows up in many stories, including The Great Gatsby. The manager of the Knights, Pop Fisher (Wilford Brimley), who is another father figure, has a name which implies that he is a “fisher of men,” like St. Peter in the bible. Thus, Pop’s allegorical role is to help Roy redeem himself. However, when Roy first joins the team, Pop is dismissive of him, saying that a guy retires at his age instead of trying to make it as a rookie. Pop mirrors Roy’s journey, because he, too, was supposed to work on a farm, as his mother wanted, but went to the big city, substituting the playing field for the farm field. Later, coach Red Blow (Richard Farnsworth) tells Roy that Pop gave his heart and soul to the game, but fell on hard financial times. 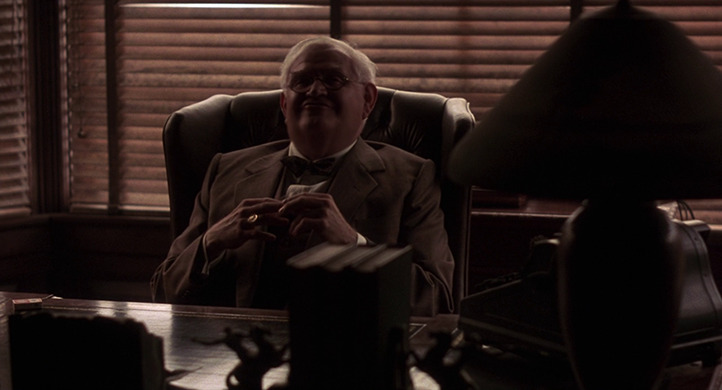 His nemesis is the Judge (Robert Prosky), who became the majority shareholder of the team when Pop had to sell off some of his shares to him. 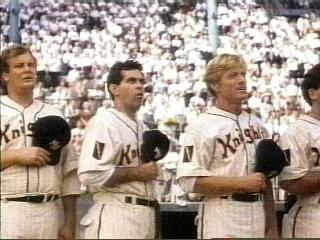 If Pop can win the pennant (a sort of Holy Grail quest) this year, then he can get the team back. But if he doesn’t achieve his goal, he is out and The Judge takes over. Pop depicts The Judge as a “snake,” bringing to mind Satan in the Garden of Eden. Pop sees the quick signing of the older Hobbs as part of a conspiracy led by The Judge to undermine the team’s success. Not that the Knights need any help in losing. They look pathetic on the field, committing numerous errors. Roy’s uniform number is 9, the same as Ted Williams, arguably the greatest hitter in the history of baseball. Despite his attempt to try to recapture his dream of playing in the big leagues, Roy still has the flaw of being attracted to the femme fatale, in this case, Memo Paris (Kim Basinger), who happens to be Pop’s niece. It is especially treacherous that Pop’s own relative conspires with The Judge, Max Mercy, and the bookie, Gus Sands (Darren McGavin) to bring Pop down. Pop believes in luck and jinxes, which makes him in tune with the magical realism of the story. He warns Roy that although he loves his niece, he believes Memo brings bad luck, since he thinks her involvement with another ballplayer, Bump Bailey (Michael Madsen), turned him into an under-performer. We later find out that Bump, too, is on the take to sink the Knights, his first name implying he is a hindrance on the road to success. Pop finally gives Roy a shot at batting practice, and Roy hits the ball out of the park a number of times. We can see Pop is starting to warm up to him when he starts calling Roy by his first name. Pop takes Bump out of a game when the right fielder misses a fly ball on purpose. Bump says he lost it in the sun on this cloudy day, prompting Pop to look up at the sky and say, “blinding.” Pop sends Roy to bat, and tells him, in exaggerated baseball lingo, to “knock the cover off of the ball.” The gods speak in the form of lightning in the sky again, and Roy literally does knock the cover off of the baseball. Gus is in the stands with Memo when it starts to storm, the downpour implying that Roy’s heroics will be raining on Gus’ parade. The amazing hit puts Roy on the major league baseball map. Max Mercy approaches him. Roy remembers Max from the Whammer episode, but Max can’t place Roy after all of these years. Roy is secretive about his past because he doesn’t want the incident with Harriet brought up as a scandal. In his column, though, since Max is in league with The Judge, he accuses Roy of using a “loaded” bat. Wonderboy passes the size and weight test, though. Pop threatens Bump with replacing him with Roy, so Bump starts to field and hit better. In what is a bit of exaggerated contrivance, Bump gets eliminated because in an overzealous attempt at trying to catch a ball, he busts through an outfield fence and dies from the injury. Roy is now the right fielder and he goes on an amazing hitting streak. He shows up now on baseball cards and magazines. Iris now lives in Chicago, although she never gave up her farm, which shows she is still connected to her upstanding roots. She has had no contact with Roy after all of these years and she is surprised to hear talk of Wonderboy and Hobbs at the cafe she frequents. One of the players likes the lightning bolt on Wonderboy, and wears a patch with the image on the arm of his uniform. He starts to hit better at practice, and someone says it’s like “Samson with the hair,” another reference to divine intervention. Eventually all of the players wear the lightning bolt insignia, which indicates how Roy’s heroics inspire the actions of others. 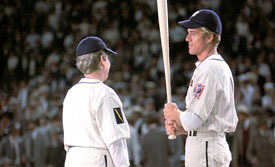 The bat boy, Bobby Savoy (George Wilkosz), admires Wonderboy, and Roy promises to help the youngster make a bat of his own. In this way, Roy rediscovers the idealism of his youth, but also now acts as a father figure himself, playing the role of his dad forward. We see Roy in newsreels talking to young boys and a girl, as he appears as a positive role model. Levinson uses black and white footage in the newsreels to lend authenticity to the time period of the film. But they also make the audience buy into the almost miraculous accomplishments of Roy because the rest of the story is grounded in reality. The Judge summons Roy for a meeting. His office is very dark and Roy says it could use some light. The Judge says that as a boy he was afraid of the dark and now has taught himself to actually prefer darkness. The absence of light associated with The Judge here becomes a metaphor for his acceptance of treachery. He is so used to being deceptive that he knows different words for a lie such as “canard” and “prevarication.” His employment of unfamiliar words is devious in itself. He says to Roy that he can see The Judge in the dark, to which Roy replies, “Maybe I do, and maybe I don’t.” With these words Roy shows that he understands that there can be false appearances hiding evil below. He learned this lesson with Harriet Bird, but is still susceptible to the pretty exterior of Memo. In this meeting, however, he stands his moral ground, and refuses to be bought by The Judge to undermine Pop and the team. (The Judge could remind one of the Wall Street men who made money by betting against their own organizations to prosper, bringing on the recession in 2008). 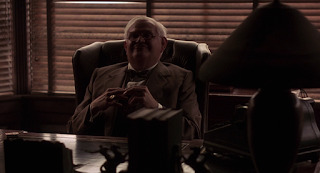 When Roy leaves the office he turns on the lights, symbolically revealing the true unsavory nature of The Judge. The Judge says “Turn off that infernal light!” “Infernal” is the adjective for “inferno” which stands for “hell.” For a fallen soul such as The Judge, heavenly light is an enemy, as sunlight is to a vampire. Gus now appears out of the darkness of the room, like a demon, saying they will have to get Roy to comply with their demands through other methods than greed. That means using Memo. Max is at a batting practice and observes Roy, who, after being encouraged by other players, pitches a ball so fast that it embeds itself in the netting of the batting cage. The camera points back at the seat where Max sat, which is now empty. We now know Max remembers his first encounter with Roy and The Whammer. Max confronts Roy with the recollection and convinces him to meet with him to give the reporter his story. They meet at dinner, but Roy is surprised to see others present. Memo is there, and Max introduces Roy to Gus. The bookie says he lost money betting against Roy’s performance. Gus always seems to bet against actions, showing an acceptance of the failure of human beings, and a desire to exploit it. This fact identifies him as an antagonist, a person who tries to stop the protagonist from reaching his goal. Max urges Gus to demonstrate his “magic eye” that he uses to see the outcome of his bets. Gus then covers one eye with the other bulging out. He looks like a monster, similar to the cyclops in The Odyssey, a creature who also tried to stop a mythic figure from getting to his home. He bets Roy that he has within a dollar only ten bucks in his pocket. It looks like he has won the bet, and Gus says to Roy forget about paying him, and says maybe Roy will do him a favor in the future instead. But Roy recognizes Gus’ scheme, and says, appropriately given the wager, “Don’t bet on it.” He then does a slight of hand and appears to pull silver coins out of Memo’s hair, showing that he actually did win the bet. This scene shows how Roy’s benevolent magic can defeat Gus’ evil powers. Roy dances with Memo and she seduces him with her feminine charms. While in bed while he is sleeping she touches his shoulder where the bullet left a scar. Roy wakes up from a nightmare involving Harriet. This image shows how Memo is connected to the femme fatale persona. However, Roy is blind at this point to seeing Memo’s power over him. Her debilitating effect on Roy, like kryptonite on Superman, causes him to go into a prolonged hitting slump, and the team falters. Levinson presents us with the image of a photographer’s light bulb slowly burning out, telling us that Roy’s fame is fading, and his allegiance to the forces of goodness are diminishing. Memo is actually caught between two worlds, one represented by Roy, and the other consisting of Gus, The Judge, and Max. She wanted Roy to win the bet with Gus, and has true feelings for him. But she has sold her soul to the devil, in this case, Gus, who provided for her when she was down and out. Iris has followed Roy’s failing performance and goes to a game when the Knights come to Chicago. She wears white and stands up as Roy is about to strike out. The sun illuminates her hat, and it looks like a halo. Her guardian angel influence (she too exerts magic) brings the light of benevolence back to Roy, who feels it as he holds and looks at Wonderboy. It’s as if the bat is a lightning rod conducting heavenly power. He hits a ball so hard on the next pitch that it shatters the scoreboard clock. He has stopped the current downward timeline on which he has traveled and now can start a fresh, uplifting one. He gets a note from Iris to meet her at the soda shop. Their reunion is awkward. Roy says he hasn’t married, and Iris says, innocently, “How did the girls miss you.” Harriet didn’t “miss” with her gunshot, a demonic version of Cupid’s arrow. Roy doesn’t want to reveal what happened to him out of shame. He does convince Iris to attend the next game, where he hits four consecutive home runs. They walk after the game and he tells her the whole story about Harriet. He was in the hospital for two years, lost his confidence, and did various jobs before trying baseball again. They go to her apartment where Roy sees a boy’s baseball glove on the sofa. Iris says it belongs to her son. Roy at first is taken aback, but smiles when she says what a great kid he is. She says his father lives in New York, and unless you are dense, which apparently Roy is when it comes to women, you realize that it is his child. Iris says maybe her son needs his father now. Roy says, “Sure. A father makes all the difference,” as it did in his life. Iris realizes that Roy would leave the game to be with his son, so she says he has to leave to catch his train for the next game. Roy is cold toward Memo on the phone, now that he has reconnected with the woman who is his moral compass. Memo, though, pretends for Gus’ sake to act like she still has “control” over Roy. 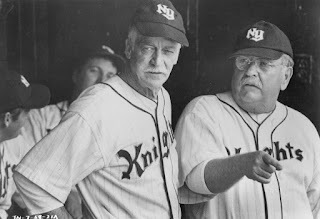 The Knights stage a miraculous comeback, echoing the New York Giants of 1951, and need just one more game to win the pennant. Roy goes to a party at Memo’s new apartment. Gus is there and he again tries to bribe him to help the Knights lose. Gus says what guy wouldn't want to be in Roy’s shoes, having a girl like Memo. Roy utters a great line about Gus’ pushiness: “You’re standing awful close Gus. I can’t tell if it’s my toes I’m feeling, or yours.” After Roy walks away, Gus grabs hold of Memo and says to her that he doesn’t like being disappointed. She feeds Roy some food that turns out to contain some poison. Roy is rushed to the nearest hospital, which is a maternity medical facility (possibly indicating he needs to be reborn after his brush with death delivered by the fatal woman?). 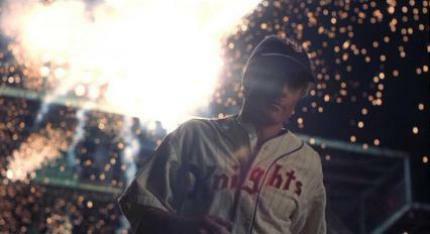 While he is unconscious for a few days, the Knights lost games, and can only win the pennant by winning a playoff game. The doctor says they pumped his digestive track and retrieved Harriet’s silver bullet, which has been deteriorating the lining of his stomach. The doctor says if he plays now his insides could explode, killing him on the spot. Roy has visitors while hospitalized, all bringing different messages. The fellow ballplayers offer their good humor and support. Memo shows up, still trying to get Roy to quit so Gus will stake them to a lot of money, but she also shows that she has genuine feelings for Roy. He confesses his lack of insight to Iris in not seeing the trouble that Harriet would bring. Their conversation echoes the one earlier in the story between Roy and Harriet. He laments that he could have broken every record in the book. She uses Harriet’s line by saying, “And then?” He again says then people would say there goes Roy Hobbs, the best there ever was in the game. Roy still seems to harbour that destructive hubris. Iris tempers his pride by saying that people live two lives, “The life we learn with and the life we live with after that.” She tells him despite not breaking records, he will be remembered for what he has accomplished and his inspiration will live on in the hope he has given to scores of young people. He moves away from his own fame and sees the bigger picture when he says, “I love baseball.” She is about to tell him about his son, but they are interrupted by a nurse. The Judge visits him at night (in the dark, of course) and tries to bribe him one last time, dropping $20,000 on his bed to make sure that if he does play, he will fail to hit a ball safely. Max has also dug up the news story about Roy and Harriet, and The Judge threatens to expose the information as a scandal. He also hints that he has another “key” player that he has swayed to help insure a loss. Once the decay of morality and optimism takes hold, it can easily spread. Roy goes to the team locker room and hears Pop say if he wins the pennant he will walk away from baseball and buy a farm, basically mirroring Roy’s journey to survive the corruption of the world and return to a pastoral home. Roy praises farm life, where it’s great to be around the greenest (implying innocent and unspoiled) things you’d ever see. Pop says Roy is the greatest hitter he ever saw, so he should “suit up.” Roy struggles in the game, but Iris gets a message to him that his son is in the crowd. 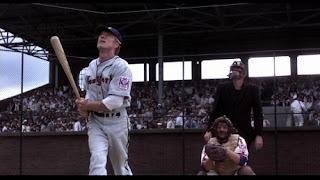 At his last at bat he hits a foul ball that shatters the glass in front of Max’s news booth, showering divine wrath on the compromised reporter. Another foul ball breaks Wonderboy. Bobby gives Roy the bat they made together, the Savoy Special. This bat symbolizes a return to the hope and potential that Roy had as a youth. 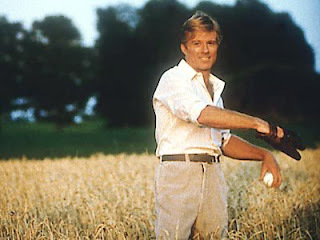 But he must face a young farm boy left-handed pitcher with a powerful fast ball. In a way, the opposing pitcher represents the future that Roy forfeited, and Roy must find redemption by triumphing despite his past mistakes. When Roy hits the next pitch, it sounds like a cannon going off and the subsequent fireworks that occur as the ball destroys the stadium’s lights show how Roy has destroyed the dark plot of The Judge, Gus, Memo, and Max. 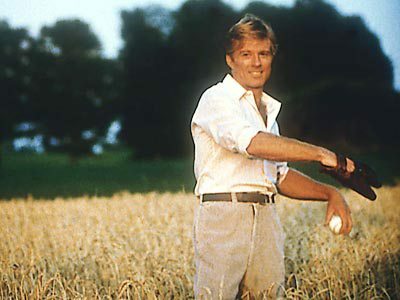 We see the ball traveling through the sky and it turns into one that Roy throws to his son as they play catch back in the fields of the farm, with Iris standing next to them, in her role as guardian angel. The hero, like Odysseus, has faced his challenges and has returned home. For the holidays, I will post a few comments om films I liked this past year.